Stop face and neck blushing, even when you are in the spotlight! Program yourself to STAY CALM and super-boost your positive mind-set and feel great and look great too – even when you are the centre of attention. Blushing is natural but it is a problem if it affects your ability to communicate or socialize normally. Sometimes being over self-conscious or not relaxed can make this condition worse. BUT it can be controlled and you can be more confident and blush less! Reducing blushing is about gradually learning to relax in difficult situations which are stressful for you, and when you do relax your blushing will ease and stop, thereby increasing our confidence at the same time. As you go through this program, and get better about relaxing and slowing down you will no longer fear certain situations which use to evoke stress and make you blush. Watch your progress as you feel more confident and begin to beat this problem., relaxing in the social situations which use to scare you. Blushing is an unconscious, ‘automated’ action, but the more concern about it a person becomes, the deeper and more pronounced the blush becomes. For most, blushing is a flushed experience which is over almost as quickly as it came, however, for others rosy cheeks are replaced by deep blotches of red skin and possibly a raised temperature and sweats. Without realizing people tend to plan for blushing to happen … they use a powerful post hypnotic suggestion, maybe they have a meeting to go to, and they repeatedly say to themselves days in advance “Oh I hope I don’t go red when I’m there”. They picture themselves going red, feel uncomfortable and then try not to think about it anymore. But it is too late; they have already laid the foundations to their suggestion. If you blush too easily and too often then you need to rebalance yourself so that you are more confident and comfortable in stressful situation. Imagine the thermostat on your heating system. If it is set too high it will keep coming on all the time and the rooms in your house will heat up and become unbearable; you would be quite uncomfortable and sweating, unable to relax. This is just like your blushing reflex … it needs to be turned down to the correct level; you need to reprogram your internal thermostat. How will this audio help? Listening to this audio regularly will help you gain control and become comfortable and confident in all kinds of stressful social occasions. Just imagine how much this would mean to you in your daily life? Without the fear of blushing to stop you, you will finally be free of this huge psychological hang-up. Blushing can make you feel as though a giant red neon sign is signaling your physical and emotional state to everyone around you. This experience alone can be embarrassing, which only seems to add to your dilemma. Even though blushing is a natural occurrence it can still bring on some serious emotions, such as helplessness and embarrassment. Control your blushing with the help of hypnotherapy! Imagine how you will feel when your blushing and neck flushing is a thing of the past! 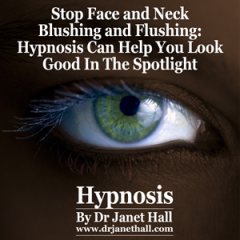 The sooner you begin regularly listening to Dr Jan’s hypnotherapy recording, the sooner that will be reality for you!